The priorities in our San Francisco dental practice include patient comfort, technology, and safety. Our office protocol includes stringent standards for infection control, and utilizes advanced diagnostic equipment that allows us to detect dental problems early. One such area of outstanding technology is the use of digital x-rays versus conventional x-ray imaging. With state-of-the-art imaging equipment, we gain accurate information that helps us identify areas of concern. The use of advanced dental technologies benefits our patients, who are deserving of healthy, beautiful smiles. 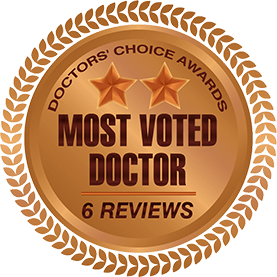 Doctors’ Choice Awards – Reviews for Dr. Leo Arellano! The highest compliment a dentist can receive from another dentist is to say that you would go to him for professional services. I would have no hesitation in sending my family or myself to Dr. Arellano. On a personal level, I have found him to be a person of high integrity and fun to be around. He challenges me to become a better dentist by his words and actions. 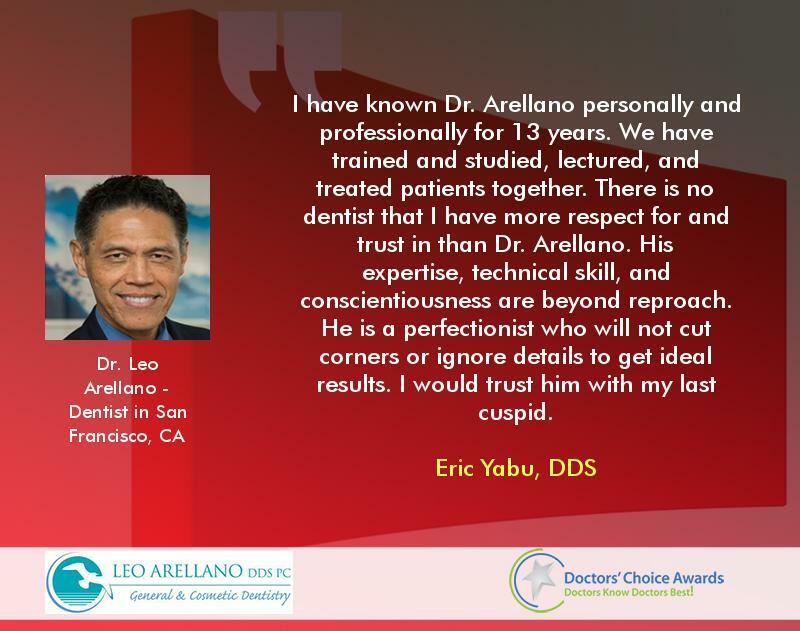 I have known Dr. Arellano personally and professionally for 13 years. We have trained and studied, lectured, and treated patients together. 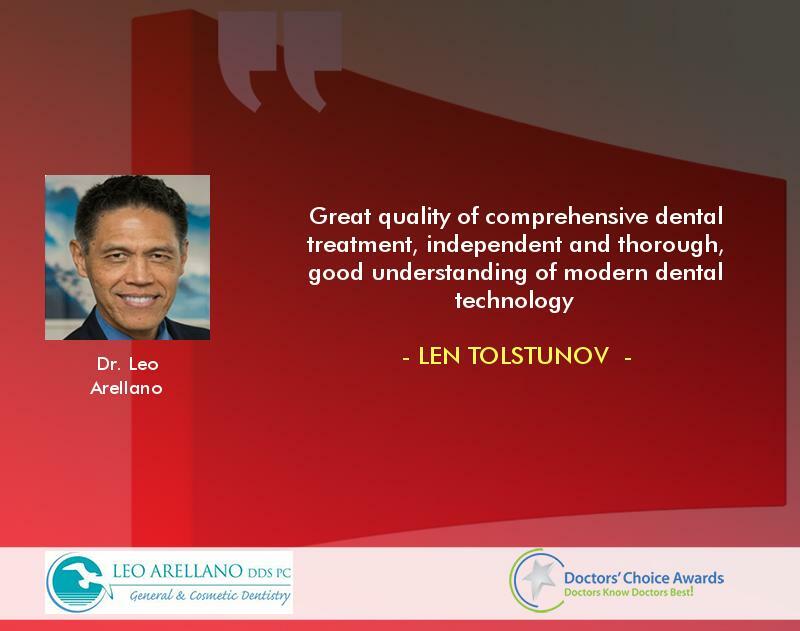 There is no dentist that I have more respect for and trust in than Dr. Arellano. His expertise, technical skill, and conscientiousness are beyond reproach. He is a perfectionist who will not cut corners or ignore details to get ideal results. I would trust him with my last cuspid. Dr. Leo Arellano is a great mentor, friend, and colleague. 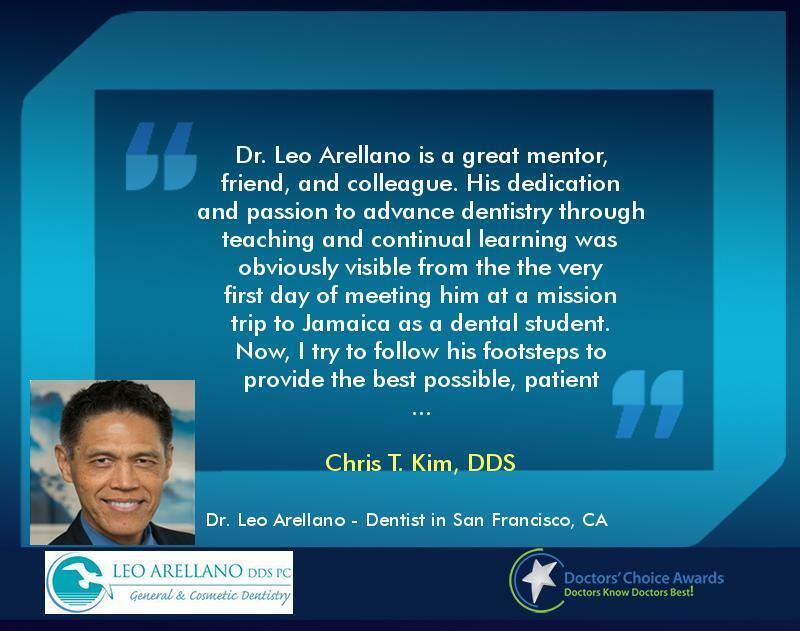 His dedication and passion to advance dentistry through teaching and continual learning was obviously visible from the the very first day of meeting him at a mission trip to Jamaica as a dental student. Now, I try to follow his footsteps to provide the best possible, patient centered care. 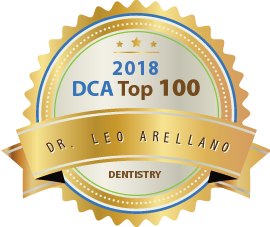 I would recommend Dr. Leo Arellano, without hesitation, to every patient searching for honest, detail oriented a professional and to every specialists who have been looking for a comprehensive, outstanding restorative dentist. I have shared mutual patients with Dr. Arellano for close to a decade. I can, without reservation, attest to the excellent quality of his clinical work, treatment planning, and patient care. He is a caring clinician that puts his patients first in all respects. 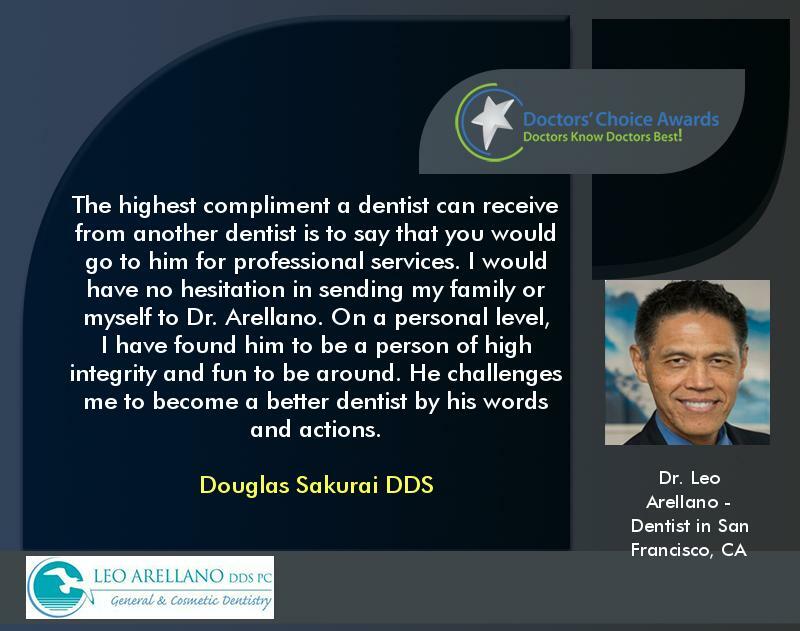 Dr. Arellano is a conscientious and detail oriented dentis. Throughout the years that we have worked together, I’ve noted that he is focused on patient care and outstanding results. His practice is always warm and welcoming. It’s been a pleasure to work with him and I will always highly recommend him to everyone. 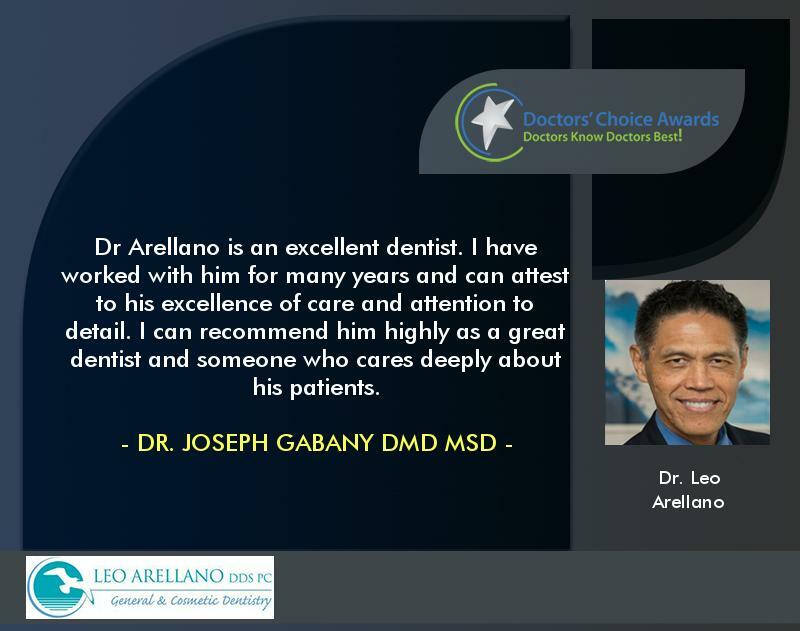 Dr Arellano is an excellent dentist. I have worked with him for many years and can attest to his excellence of care and attention to detail. 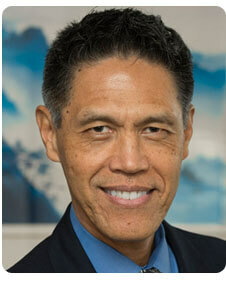 I can recommend him highly as a great dentist and someone who cares deeply about his patients. 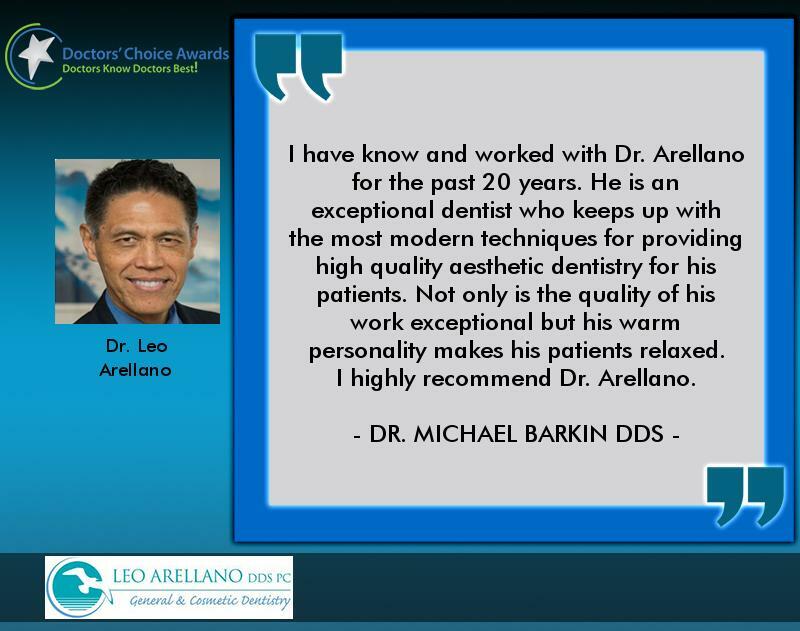 I have know and worked with Dr. Arellano for the past 20 years. He is an exceptional dentist who keeps up with the most modern techniques for providing high quality aesthetic dentistry for his patients. Not only is the quality of his work exceptional but his warm personality makes his patients relaxed. I highly recommend Dr. Arellano.